Wow, what a wonderful book. I kept hearing how great this book was and tried to get it as an audio-book for my drive to Connecticut but it was checked out of the library. I am glad I read it as a real book though as I love the feel of the book and the ability to flip back and forth throughout the book, especially because the story jumps from August 7 1944, to 1934, to August 8 1944, and back and forth throughout, ending in the 1970 and 2014. 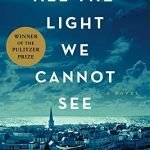 It is a charming story about a young blind girl facing the reality of WW II in France and how her life crosses with a young German boy who was a victim of Nazi Germany. I found myself eagerly trying to find time each day to read and to find out what happens next to Marie-Laure (interesting my mothers name is Mary Louise, maybe that is why I loved this young girl so much) and Werner. All I can say is “read this book”.